This might be one of the longer walks but it's one of the most rewarding for anyone interested in industrial history. 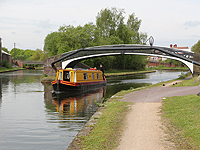 From Gas Street Basin where the BCN meets the Worcester and Birmingham Canal at Worcester Bar, walk towards the ICC along a towpath full of shoppers and tourists. Then go left in front of the Sea Life Centre opposite the NIA. at Deep Cutting Junction aka Old Turn. From here this is a walk along the Birmingham Main Line (new and old) into the Black Country. Leaving the swish apartments of the City Centre and Oozells Street Loop behind, look out for the 'Roundhouse' just after Sheecote St. Bridge, a striking horse shoe structure, originally a warehouse and stables. Dereliction and graffiti is unremitting as you pass the eastern end of the Icknield Port Loop but soon to be developed. These loops were part of the meandering Old Main Line built by James Brindley, by-passed by Telford's very much straighter New Main Line. At Rotton Park Junction take the Soho Loop and, after a fairly unpromising start if you're not an industrial archaeologist, there's parkland and a neat housing estate. All but hidden opposite is the City Hospital. At Hockley Port Junction, the Soho Branch once served Boulton's Soho Manufactory, the world's first modern mass production factory, and several railway interchange basins at Hockley Goods Yard (Hockley Port). Trade ceased in the 1950s and it now accommodates a few boats. Further on, HM Prison Brimingham better known as Winson Green appears on the horizon and you pass the forbiddingly named Workhouse Wharf and Asylum Bridge, references to other establishments that were once located on a loop that's 1¼ miles long before rejoining the main line. Turning right, back onto the new main line by the railway sidings at Winson Green Junction, you'll pass the Gauging Island and then the disused Cape Arm (another part of the old line) on the other side of the canal. One notable factory on the Cape Arm was Fox, Henderson & Co.'s London Works where the metal framing was manufactured for the Crystal Palace and Great Exhibition of 1851. Subsequently the works were taken over by the company that became GKN. The basin you cross opposite the Cape Arm served Adkins & Nock Soap Works (the nearby railway junction is called Soap Works Junction), and later the Mond Nickel Co.
After the canal dips under the Avery (Soho) Rail Bridge, you'll reach the site of the Soho Foundry established in 1796. It was here that Matthew Boulton and James Watt built the steam engines that powered the industrial revolution. Opposite is French Walls which housed Muntz's Metal Works. George Muntz made a fortune producing sheet metal from a patented alloy of copper and zinc that was used for boat hulls, including the Cutty Sark, as a cheaper and more effective alternative to pure copper. Next to the foundry was Smethwick Gas Works initally established by William Murdock c. 1805, the country's first commercial manufactured gas works. Further on was Tangye's Cornwall Engineering Works, built on the site of Rabone Hall, which produced hydraulic presses and jacks, and adjacent was Woodford Iron Works. All of these factories had their own basins, some of which are more visible today than others. Bear right following the Old Main Line at Smethwick Junction to Smethwick Locks that had to be constructed due to the geological difficulties of building a tunnel. However, there was a constant lack of water and Boulton & Watt pumping engines were therefore employed to return water to the summit. The summit was also lowered and the number of locks halved, with a duplicate set of locks inserted at the Smethwick end, which are the ones that survive today. Two of the other solutions are still apparent. There's Telford's Engine Aqueduct, an iron trough supported by a highly decorative cast iron arch completed in 1825, leading to the Engine Arm that fed water from Rotton Park Reservoir (this can be explored until you reach private moorings), and secondly the Smethwick Pump House, which replaced the original Engine House in 1892, pumping water from the new to the old line. Turn left at the junction onto the New Main Line and huge columns supporting the M5 occupy the middle of the canal. After going under the Stewart or Steward Aqueduct carrying the Old Main Line, there's plenty to keep your interest on the way back to Smethwick Junction. The derelict buildings that you pass on the left are where Chance Brothers were based for 150 years, innovative glassmakers who glazed the Crystal Palace, the four faces of Big Ben and lighthouses throughout the world. Where there is a lighthouse, there is probably still Chance glass. Following Spon Lane Bridge a more verdant landscape takes over and birds try to make themselves heard above the rumble of the motorway. Galton Bridge and Tunnel are then reached, the bridge is a single span of 151 feet and was once the highest in the world, the tunnel by contrast is boring modern concrete. Then, just before the Smethwick Stop, you have the privilege of admiring from below the finely detailed cast iron of the Engine Aqueduct. After Smethwick Junction and Towing Path Bridge, industry kicks in with a vegenence. Take the right hand towpath back to the City Centre and you'll have a good view of the Soho Foundry and the landscape very gradually becomes greener, with trees lining the towpath and elegant Horseley Bridges decorating the canal.